Betulin derivatives have been proven effective in vitro against Leishmania donovani amastigotes, which cause visceral leishmaniasis. Identifying the molecular targets and molecular mechanisms underlying their action is a currently an unmet challenge. In the present study, we tackle this problem using computational methods to establish properties essential for activity as well as to screen betulin derivatives against potential targets. Recursive partitioning classification methods were explored to develop predictive models for 58 diverse betulin derivatives inhibitors of L. donovani amastigotes. The established models were validated on a testing set, showing excellent performance. Molecular fingerprints FCFP_6 and ALogP were extracted as the physicochemical properties most extensively involved in separating inhibitors from non-inhibitors. The potential targets of betulin derivatives inhibitors were predicted by in silico target fishing using structure-based pharmacophore searching and compound-pharmacophore-target-pathway network analysis, first on PDB and then among L. donovani homologs using a PSI-BLAST search. The essential identified proteins are all related to protein kinase family. Previous research already suggested members of the cyclin-dependent kinase family and MAP kinases as Leishmania potential drug targets. The PSI-BLAST search suggests two L. donovani proteins to be especially attractive as putative betulin target, heat shock protein 83 and membrane transporter D1. Leishmaniasis is a neglected tropical disease caused by Leishmania protozoan parasites that affect millions of people worldwide [1–3]. During the past decade, leishmaniasis has spread considerably, and an increasing number of new cases are being reported every year . Several treatments exist for leishmaniasis , but they are not fully active, have adverse effects, loss of efficacy and are highly expensive . Hence, there is an urgent need to develop new, safe and effective medications. Betulin derivatives have a significant in vitro inhibition growth of L. donovani amastigotes, which cause visceral leishmaniasis, the most severe form of the disease [6, 7]. 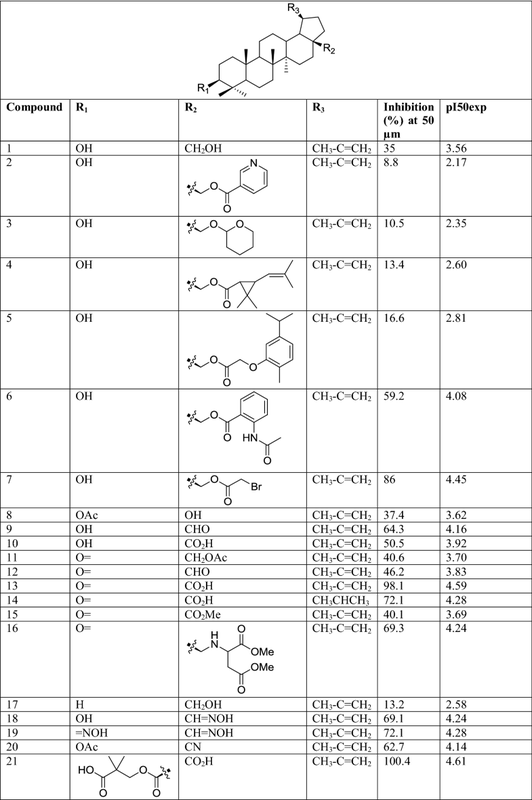 Betulinic acid and other betulin derivatives have furthermore remarkable antiviral [8–11], anti-HIV , antiulcer , anti-inflammatory [14, 15], anti-malaria [16, 17] and anti-tumoral [18–20] activity that make this class of compounds promising for new drugs discovery [21–24]. Structure–activity relationships and pharmacological properties of betulin have been studied previously [25–29]. Recently, our collaborators have synthesized 58 betulin heterocyclic derivatives and evaluated their activity and selectivity against L. donovani amastigotes with similar or better inhibitory activity (> 80%) than some well-known antibiotics (Nystatin, Pentamycin, Amphotericin) [6, 30, 31]. 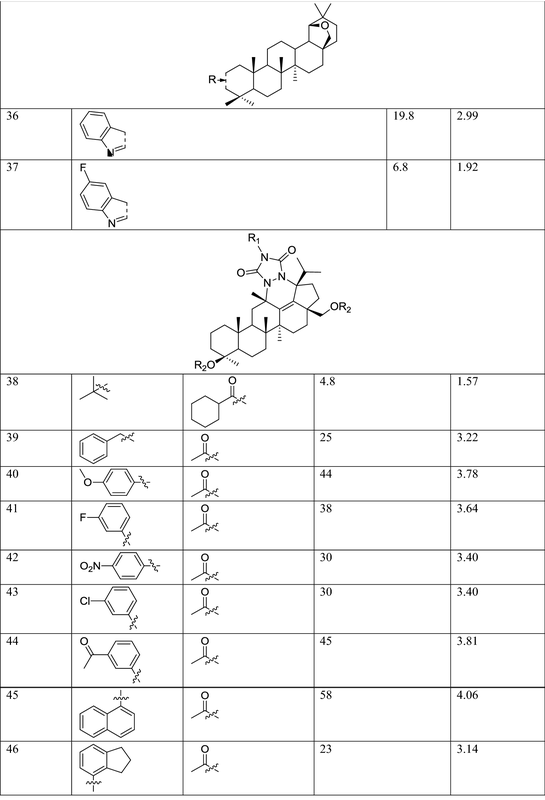 Computational methods such as QSAR  and pharmacophore modeling  are important methods in modern drug discovery that have been successfully applied for modeling activities of betulin derivatives [34–42]. However, the congeneric series are still limited, and the mechanism of action of these compounds are still undefined. To date, very few computational studies and models have been done on Betulin derivatives to explore the full potential of this class of compounds, with one derivatives in clinical phase 3 (Oleogel-S10), and accelerate the understanding of their mode of action. In the present study, we report an application of classification method, recursive partitioning (RP) to build predictive models of the inhibitory activity of betulin derivatives and characterize their molecular properties. RP models can select essential molecular descriptors according to the decrease of the performance resulting from the random permutation of the variables. Also, we investigated the compound-target interaction network and potential pharmacological actions by reverse pharmacophore database screening. Although it can be to some extent debated , it is commonly accepted that structurally similar compounds have similar biological activity  and may also recognize homologous targets across organisms . This concept spurs us to assume the proteins interacting with compounds that are similar to betulin derivatives in the structure are potential binding targets as well. We thus screened potent betulin inhibitors of Leishmania growth against PharmaDB , a database containing a collection of pharmacophores model built from protein-ligand complexes, to identify possible targets. 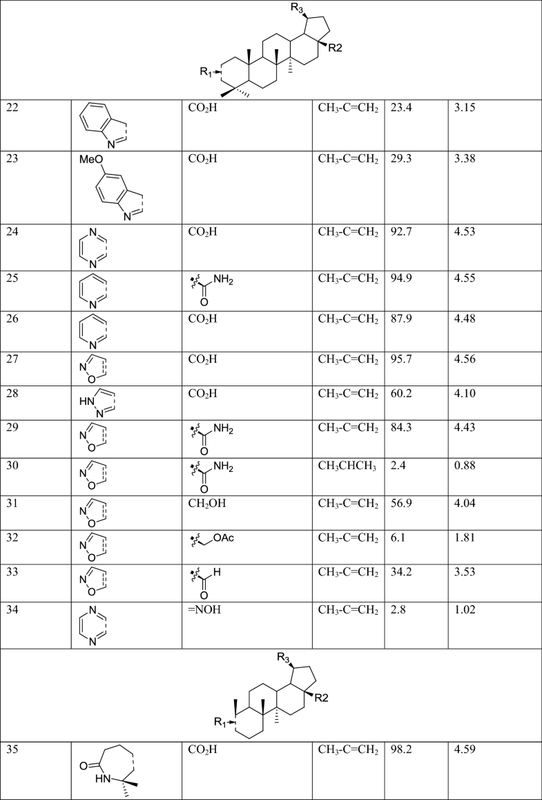 The molecular structures and biological data used in this study, 58 betulin derivatives synthesized by the Yli-Kauhaluoma group, were retrieved from references [6, 30, 31] (Table 1). The biological activities are reported as the percentage inhibition of L. donovani axenic amastigotes growth at 50 μM concentrations. Three datasets were generated, and the compounds were categorized in different classes depending on their % of inhibition (%I) in three different ways (Table 2). Dataset 1, the compounds were divided into two classes as active (%I ≥ 49) and inactive (%I < 49). Dataset 2, the compounds were divided into three classes as active (%I > 69), moderate active (%I ≥ 36 et ≤ 69) and inactive (%I < 36). Dataset 3, is similar to Dataset 2 but the group of moderately active compounds, considered as an uncertainty buffer, is not used. The skeleton of betulin derivatives was drawn using ChemBioDraw Ultra 12.0, assigning hydrogen atoms with Maestro 9.6 (Schrödinger). After that, the dataset was prepared by Discovery Studio 4.5 (Accelrys Inc.) (DS 4.5). Partial charges of structures were calculated based on the CHARMm force field. Full minimization was run with the Smart minimizer algorithm until root mean square gradient was 0.01 and maximum 2000 steps. No implicit solvent model was included. RP is a classification method for multivariable data analysis. It creates a decision tree to correctly classify and uncover relationships between members of the dataset based on a dichotomous splitting of a dependent property, in our case compounds properties and their %I. RP analysis was carried out using DS 4.5 to develop decision trees that categorize the compounds into two and three classes based on the % inhibition. RP single tree (ST) models and multi-tree bagged forest (BF) models made up of multiple trees were used. Both ST and BF models are particularly appropriate in case of imbalanced training data and are easily interpretable, while also providing a significant degree of predictive accuracy [47–50]. For both methods, a training set was used to build the decision trees, and a test set was utilized to evaluate the predictive power of the models. Using two splitting methods, we generated two training and test sets from each of the three datasets (see Tables 3 and 4). The first method (split by diversity) assigns a diverse subset of compounds to the training and test set. The second way (random per cluster) cluster the compounds by similarity and then randomly assigned compounds from each group between the training and test set. Both methods use 2D fingerprint molecular descriptors and a proportion of 70% data for the training versus 30% for the test set. BF has a relatively small number of trees (10) generated using a separate bootstrap sample of the original data for each tree. All descriptors are considered as possible splitting criteria for each node and weighting method is set to “by class” by default, to compensate for imbalanced data. All others parameters were set to default. BF can measure how each descriptor contributes to the prediction accuracy in the course of training. We estimated the predictive ability of the ST models with five fold cross-validation and BF models using out-of bag statistics. For BF, in each bootstrap training set, around one-third of the instances are left out, constituting the out-of-bag sample. The test set was used to estimate the fitting ability of the ST and RF models on a new dataset that was not used in the model construction. The performance of the ST and BF models are based on three metrics: true positive rate (recall or sensitivity), specificity, and the area under the curve (AUC) of the receiver operating characteristics (ROC) plot. AUC or ROC score represents the probability that a classifier will be estimated correctly, with values 0.5 indicating better than random prediction and 1 signifying perfect prediction . By screening a compound against a panel of pharmacophore models derived from multiple pharmacological targets, the potential targets of the compound can be outlined. Automated ligand profiling available in DS 4.5 so-called “Ligand Profiler” protocol was used . DS 4.5 is equipped with a pharmacophore database PharmaDB that is the largest ever-reported collection of structure-based pharmacophores, 68,056 entries from 8166 protein-ligand X-ray structures [46, 53, 54]. These pharmacophores are derived from the sc-PDB dataset, a collection of 3D structures of binding sites found in the Protein Data Bank. For most actives betulin derivatives, all the pharmacophore models from PharmaDB were selected for the virtual screening with default settings. The rigid mode was used as the molecular mapping algorithm. No molecular features were allowed to be missed while mapping these compounds to the pharmacophore models to increase selectivity. The minimal inter-feature distance was set at 0.5 Å. For each target, the name and pathway information was collected from ChEMBL  and WikiPathways  databases using KNIME  version 3.1.2. Compound-Target-Pathway networks were generated by Cytoscape 3.0 (Cytoscape Consortium, USA)  where network nodes illustrate compounds, targets, and biological pathways. The edges linking the compound-target and target-pathway describe their relationships. Position-Specific Iterated BLAST (PSI-BLAST) search is done to identify the homologous protein in L. donovani from the selected target as the query sequence . The robustness and efficiency of classification models are usually affected by the diversity of dataset used for modeling, with the effect that the more diverse are the compounds, the broader will be the applicability of the model. The dissimilarity between any two molecules was computed using a Tanimoto coefficient. In this study, the average fingerprint distance for the dataset of 58 betulin derivatives inhibitors is 0.7 with a minimum of 0.12 and maximum at 0.9. 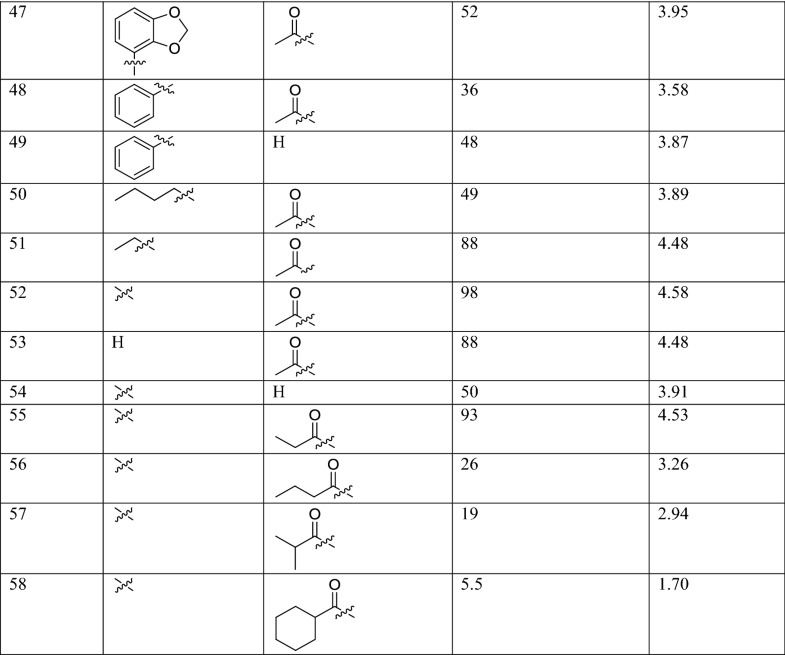 Figure 1a shows a broad range of diversity across compounds. Also, the data set has an average molecular property distance of 1.33, minimum at 0.067 and maximum at 2.75 which shows good structural and property diversity of the dataset. Two different methods, diversity and random per cluster were used to split the dataset into test and training sets. (see Tables 3 and 4) Different inhibitory classes with varying distributions of training-test where thus created (Fig. 1b). Detailed result of ST and BF models are reported Tables 3 and 4 respectively. The ST and RF models performance are comparable. As shown, BF was able to find predictive models from dataset 2 with both splitting method. The ROC score for the in-bag training data for all trees in the forest model is 0.99 and 0.96, and the out-of-bag ROC score is 0.59 and 0.71 for the training set. The in-bag results are predictions for the data used to train the tree, while the out-of-bag results are predictions for the left-out data. The external test sets including 13 and 10 compounds respectively were used to evaluate the predictive ability of the two models. The ROC score on external test sets is good, 0.87 and 0.94 respectively. The confusion matrix, as well as sensitivity and specificity values, are presented in Additional file 1: Table S1, Additional file 2: Table S2. In the betulin derivatives inhibitors models, RF and ST method can correctly classify most of the molecules of the external test set. These outcomes indicate that the developed ST and RF models show favorable and robust prediction performance. The Y-randomization test was performed four times, and the AUC values for the model using the data set with experimental activity values were significantly higher than those obtained from the dataset with randomized values, indicating the robustness of our models. The most suitable sets of molecular descriptors for predicting Betulin derivatives inhibitors were extracted from the RF prediction models via feature selection. A summary of descriptors based on their frequency of occurrences in the models are given in Table 5. The FCFP_6 feature, number aromatic rings, number rings, molecular fractional polar surface area, molecular weight, number rotatable bonds are predominant in all models. In general, the frequency at which a descriptor was selected empirically appears to distinguish truly important descriptors from others best. In the RF models of betulin derivatives inhibitors, FCFP_6 feature, number aromatic rings are the most critical descriptors for classification. The profiling results from 13 most actives compounds are presented in Table 6. The fit value was used to measure the fitness of the ligand and pharmacophore. A fit value equal or higher to 0.9 was used as a threshold to select targets from the activity profiler result (see Fig. 2). The 13 compounds mapped 47 pharmacophores models out of a total of 68,056 models with a rigid mapping and the presence of all molecular features required. These models belonged to 32 protein targets and were involved in 184 pathways. 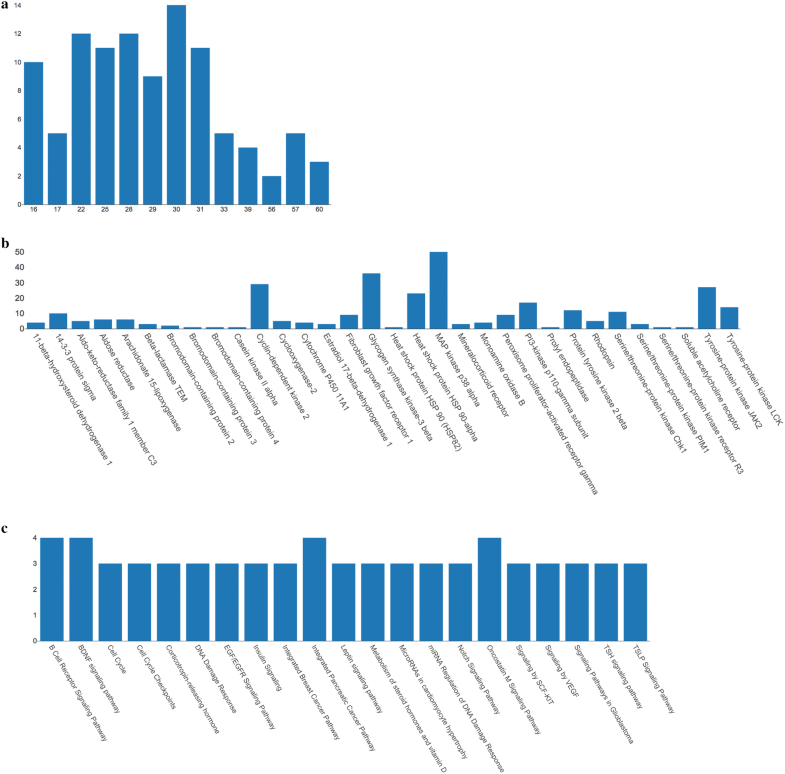 Protein sequences of all the predicted targets were collected, and a blast search was run on NCBI server to identify homolog in L. donovani (Table 7). A topological analysis of the network pharmacology compound-pharmacophore-target-pathway offered insights into the biologically relevant connectivity patterns, and profoundly essential targets or pathways. A general overview of the global topological properties of the network was obtained from the statistical data by the Network Analyzer of Cytoscape. 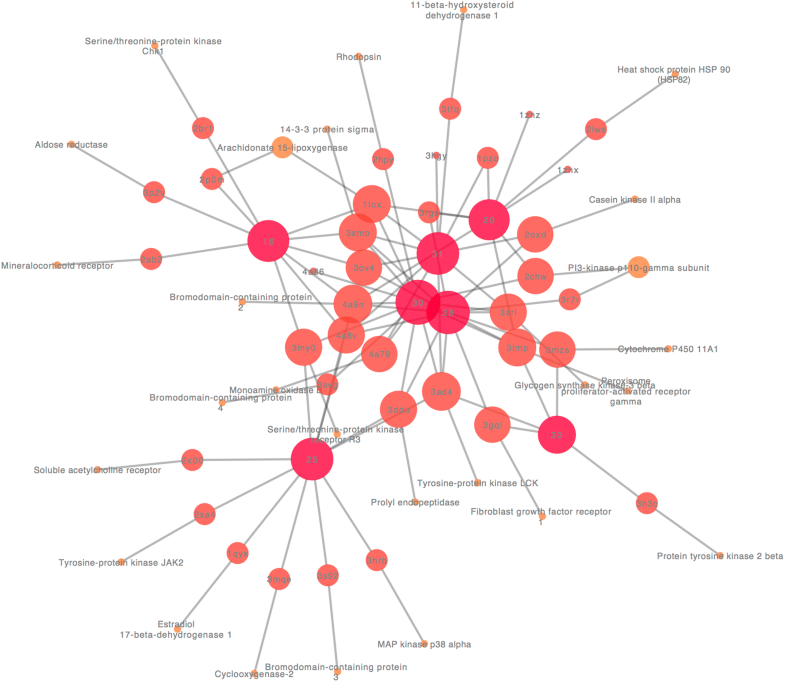 The full pharmacological network of L. donovani betulin derivatives inhibitors had three types of nodes, compounds, pharmacophores, and targets with related pathway information (Additional file 3: Fig. S1). The 13 compounds nodes formed the core of the network which fit 47 pharmacophores and was surrounded by the target nodes. Each target was linked to at least one pathway. A total of 209 pathway nodes constituted the outer layer of the network. Most pharmacophores were the center of a sub network-shaped connection. For seven targets, no pathway was identified. Three pharmacophores are involved in a little number of pathways, between 2 and 3 for each proposed target. Six pharmacophores formed a closed network of 2–4 pathways for each target. Pharmacophores, targets, and pathways were strongly interconnected in many-to-many relationships. Figure 3 presents a subset of the pharmacological network of L. donovani betulin derivatives inhibitors limited to its most connected compounds and targets nodes. The diameter of the network was 10, the centralization was 0.18, and the density was 0.011. To reduce the number of candidate targets and identify more potential targets based on targets identified from network pharmacology, the degrees distribution of all the alkaloids (Fig. 4a) and essential targets (Fig. 4b) were investigated. The compounds with higher degree values (≥ 9), such as 1, 3, 4, 5, 6, 7 and 8, that participate in more interactions than the other components are the hubs in the network. The target degree values ranged between 1 and 50. The targets with the highest degree (≥ 10) values are MAP kinase p38 alpha (50), Glycogen synthase kinase-3 beta (36), Cyclin-dependent kinase 2 (29), Tyrosine-protein kinase JAK2 (27), Heat shock protein HSP 90-alpha (23), PI3-kinase p110-gamma subunit (17), Tyrosine-protein kinase LCK (14), Tyrosine-protein kinase 2 beta (12), Serine/threonine-protein kinase Chk1(11) and 14-3-3 protein sigma (10). The highly connected nodes are referred to as the hubs of the network for target prediction. To find the relations between target proteins and the critical pathway further, we analyzed the target-pathway network. Logically, the weight of one pathway which contains many druggable target proteins is more significant than for many pathways including a single target protein that can be actioned by many drug molecules. The critical pathways (highest degree level) are summarized in Fig. 4c. These results suggested that B Cell Receptor Signaling, Brain-derived neurotrophic factor (BDNF) signaling, Integrated Pancreatic Cancer, Oncostatin M Signaling pathways may bind compounds with pharmacophoric similarities to betulin derivatives. Homologous targets were identified in L. donovani from the PSI-BLAST search as the potential target of Betulin derivatives. Table 7 shows a summary of L. donovani homologous targets with E-value < 3. A total of 27 proteins selected as similar to one or more targets identified by target fishing. It is well known that the unknown targets and underlying mechanisms restrict the development of novel therapeutics against Leishmania. In silico predictive modeling offer new tools to overcome these shortages. However, many existing methodologies offers complex predictive models and relative applicability by the experimental chemist. To increase the utility, we proposed classification models and compounds-target-pathway interaction network to predict Leishmania activity of new compounds and discern the targets and potential pathways from a set of betulin derivatives active in vitro against L. Donovani. We successfully build two type of recursive partitioning classification models, single tree and bagged forest models. A forest model is less directly interpretable than a single-tree model in that there is not merely one tree to interpret, but depending on the type of forest, anywhere from tens to hundreds of trees. On the other hand, a forest model provides statistical measures of the relative importance of the various descriptors in distinguishing among the different classes, which is not available with single-tree models. When none of the descriptors is strongly correlated with the class membership, single-tree models can be brittle, in that a relatively small change in the training data results in a significant difference in the structure of the tree, and thus in the tree’s predictions. A forest model helps to address this problem. In principle, Network analysis has the potential to allow the target identification of L. donovani betulin derivatives inhibitors. The proteins in the hubs of the network (highly connected nodes) are highly associated with each other. The most critical proteins with high degree value are all related to protein kinase family. Among them, MAP kinase p38 alpha, Glycogen synthase kinase-3 beta, Cyclin-dependent kinase 2, Tyrosine-protein kinase JAK2, Heat shock protein HSP 90-alpha, PI3-kinase p110-gamma subunit, Tyrosine-protein kinase LCK, Protein tyrosine kinase 2 beta, Serine/threonine-protein kinase Chk and 14-3-3 protein sigma. They are involved in directing cellular responses to a diverse array of stimuli (such as mitogens, heat shock, and pro-inflammatory cytokines) and regulate proliferation, gene expression, mitosis, cell survival, apoptosis and many other cell functions . The mode of action of these critical proteins may be done through the integrated biological network rather than by individual target. The four central pathways, B Cell Receptor, Brain-derived neurotrophic (BDNF), Integrated Pancreatic Cancer and Oncostatin M, have higher frequencies than the rest. Members of the cyclin-dependent kinase family and MAP kinases had been previously identified as essential for Leishmania and suggested as potential drug targets . Homologous targets, Heat shock protein 83 and Membrane transporter D1 were identified as a possible target in L. donovani and proposed for experimental validation. Among the chaperones, heat shock protein 83 (Hsp83) is alternately referred to as Hsp90 or Hsp86 due to the variable molecular weight amongst different orthologues is a family of emerging targets for infectious diseases. Hsp83 is best known as cancer targets with some drug candidates in clinical development [62, 63]. Transporters are proteins that play a role in bringing small molecules across biological membranes. The function of transporters as therapeutic targets is a well-established new field of research . Transporters are new therapeutic targets for treating rare diseases. But there is no, till today, a case of exploration of Hsp83 or Membrane transporter D1 as a drug target in L. donovani. The results offer the opportunity to characterize the chemical sensitivity of the parasitic chaperone and Membrane transporter D1 against our library of Betulin derivatives L. donovani inhibitors with biophysical and biochemical techniques. In this study, Recursive partitioning (both ST and BF) methods were firstly used to develop classification models for the inhibitory activity of 58 betulin derivatives in vitro against L. donovani amastigotes. These models can be used to screen a large compound library for facilitating the discovery of the novel lead compounds. Most relevant molecular features of betulin derivative inhibition were identified. These features provide an excellent analytical perspective to explain the similarities and differences between betulin derivative inhibitors and non-inhibitors. The potential targets of these compounds were determined through in silico target fishing, which combines 3D structure-based pharmacophore searching and network pharmacology analysis. Using this strategy, we inferred links between most active compounds and Leishmaniasis disease through molecular targets and keys signaling pathways. Further studies need to validate identified targets and to test the effects of betulin derivatives on identified pathways and their interactions (Additional file 4: Fig. S2, Additional file 5). YZ gathered the dataset and prepared the compounds for predictive modeling. HX, YZ and LG conceived and designed the work, analyzed the results, and drafted the manuscript. LG performed the recursive classification modeling and target identification. The manuscript was written through contributions of all authors. All authors read and approved the final manuscript. This study was fund by the Drug Discovery and Computational Biology consortium from Biocenter-Finland. The Center for Scientific Computing is thanked for help with computational resources and data storage. We would like to thank Evgeni Grazhdankin who helped with the Fig. 1a. The three compounds datasets used for recursive classification and the 13 most active betulin derivative inhibitors are available for download as sdf format at http://idaapm.helsinki.fi/betulin_dataset.tar.gz. 13321_2018_291_MOESM1_ESM.docx Additional file 1: Table S1. Bagged forest confusion matrix. 13321_2018_291_MOESM2_ESM.docx Additional file 2: Table S2. Single tree confusion matrix. 13321_2018_291_MOESM3_ESM.docx Additional file 3: Fig. S1. Full pharmacological network of Leishmania donovani Betulin derivatives inhibitors. Betulin derivatives inhibitors, pharmacophore, targets and biopathway with a red to gray gradient scale. 13321_2018_291_MOESM4_ESM.docx Additional file 4: Fig. S2. Superimposition of potential protein target structures. 13321_2018_291_MOESM5_ESM.zip Additional file 5. Zip file with all potential protein target structures protein data bank files.